Carrie White is a shy and introverted girl. She’s having a rough go of navigating the rocky, hormone strewn waters of high school. Her mother, a religiously preoccupied zealot, enforces a strict disciplinary regiment upon poor Carrie, who does her best to comply so as to keep her mother happy. It’s a tenuous balance at best, between dealing with the wilds of adolescence in a fast paced world as well as dealing with the repressive control of a relentlessly pious mother, but Carrie is doing her best. For all of her attempts at normalcy, everything comes crashing down when Carrie finds out that she has developed telekinetic powers. 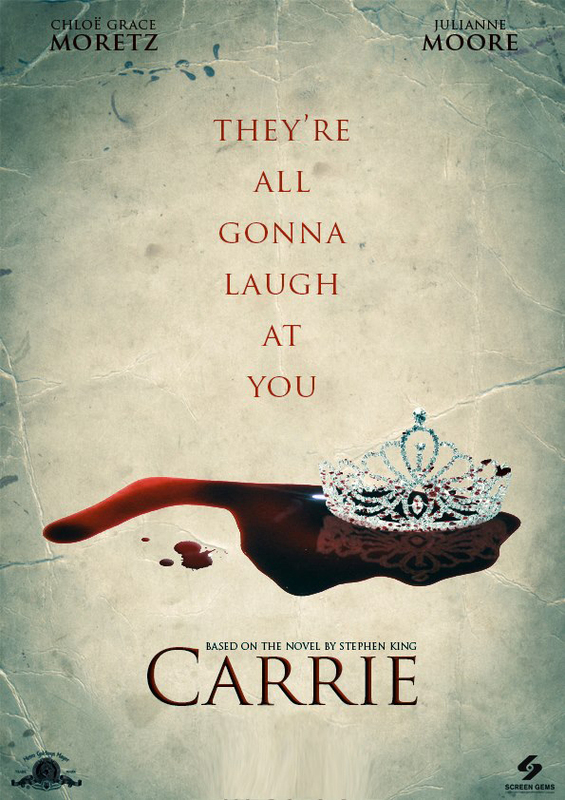 Needless to say, it’s a perilous proposition for any director to take on a remake of such a beloved cornerstone of the horror genre, but in Carrie, director Kimberly Pierce does a fine job of giving the story a new facelift. Cholë Grace Moretz and Julianne Moore are strong in the roles of Carrie and Mrs. White, respectively. Moretz does justice to the titular character, playing the role convincingly as the socially stunted high school loner. Moore is great in the role of Mrs. White, giving a sense of menace and treachery under the guise of religious benevolence. The strength of both of these actors is what gives the movie a good dynamic; the interplay between the two is convincing enough to make you see the turmoil in their relationship. A tightly written script and good pacing encapsulate the performances of the two leads, making for a better film than most horror movies of recent memory, and setting this film up to be the one that a new generation of horror fans will remember fondly. By the very nature of being a remake, it’s virtually impossible to separate this from the original 1976 Brian De Palma movie. I imagine that any director at the helm of any remake would respect this fact; that, as the project is an homage to a previous vision, so would the reaction by the viewing public be tuned into the same wavelength of the director’s fandom. Indeed, there are things that have to be in the remake that harken to its predecessor in order for it to have the feel of the original, but it’s the consequent decisions and creativity of the director that give the remake purpose. With this in mind, the update of Carrie has a few issues with being transplanted to a modern age. The internet and social media play a big role in this movie, but the very existence of such technology makes it difficult to believe that such a sheltered and socially unaware character such as Carrie could exist. There are other little things like this in the movie, but mostly, the issue is with the weird sense of anachronism; that Carrie and her mother feel like they don’t belong in the time when the movie takes place. Then again, if you’re going to be able to buy the idea that a high school girl can move stuff with her mind, buying that her mom still uses a wall mounted rotary phone isn’t such a big deal. Overall, Carrie is a new film for a new generation of moviegoers and horror fanatics. Chloë Grace Moretz and Julianne Moore give great and convincing performances that will, no doubt, give appreciators of the original the creepy feeling that they look for as well as delivering the creep factor to people who are unfamiliar with the original. In a Halloween season surprisingly bereft of horror fare, Carrie is a welcome addition to the genre. Carrie opens today in Philly area theaters.